The folks at Whatifsports ran 10,000 simulations of this week's Vikings versus Steelers contest and predicts that the Vikings will win, probably in a squeaker. How close? The average score was Minnesota 23.8-Steelers 23.4. The web page for this simulated game includes a whole host of simulated statistics ~ very interesting stuff! Each week (or nearly so) I bring you a statistical comparison of the Steelers and their opponent. Now I've decided to give you a look at the actual numbers. What follows is in the same format of the weekly statistics, only now you'll see the actual numbers. Where applicable the season average(s) is included in parentheses. For this week the only question is why was the game so close? Looking at the statistics it seems that the Browns have achieved their 1-4 record so far this season on merit. One number that screamed out ~ their leading receiver is a fullback; and while he is the Browns' only top 50 receiver (amongst AFC receivers) the Steelers have five. The media and fans alike are now suddenly acknowledging just how important Aaron Smith has been to the success of the Steelers' defense in defending the run; and as simple, declarative statements are made as to the impact of his loss there is very little . . . oh, what do you call that . . . evidence . . . being offered up. So, in order to place Aaron Smith's value in some kind of context, we present the numbers. As has been mentioned here before, the end of the 2007 season (the last time Mr. Smith missed significant time) saw the Steelers' defense transformed from the NFL's #1 unit to something very less fearsome. In the final six games of the 2007 season (five regular season games and one playoff game) the Pittsburgh defense surrendered 725 yards on 158 carries, for a 4.59 yards per carry average. By way of contrast in the preceding eleven games, all of which Mr. Smith played, the defense gave up 848 yards on 232 carries, for a 3.66 yards per carry average. Of course 2008 saw Mr. Smith return to the lineup, and during last season the defense gave up an average of 4.0 yards, or more, per carry twice ~ 4.0 yards per carry versus the Redskins and 6.1 yards per carry versus New England. Finally, so far this season the defense has surrendered an average of 4.0 yards, or more, per carry twice ~ against Cincinnati (19 carries, 100 yards, 5.3 yards per carry) and Detroit (110 yards, 25 carries, 4.4 yards per carry). I do not expect much from the Browns ~ certainly they will try to run, and there is little doubt that they will run at whomever is on the field for Mr. Smith ~ but the real concern is October 25th when the Steelers host Adrian Peterson. Once can only hope that the committee of players replacing Aaron Smith is up to the task. Word out of Pittsburgh is that Aaron Smith will be missing from this weekend's game, and maybe a substantial number of games besides that. The Steelers have been down this road before ~ i.e. missing their All-Pro caliber defensive end ~ and the results were not pretty. For a look back to the last time Aaron Smith missed substantial action, a look back that played out more like a nightmare, click here for one of the more illuminating statistical analyses ever completed by Pittsburgh Steelers Fanatic. Pittsburgh is the number one sports city in America. You can also read about what it is to be a displaced 'Burgher here here. 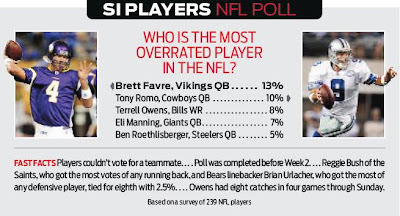 Brett Favre I get (though his performance on Monday night was pretty impressive), but Ben Roethlisberger? For all the grief that the Lions take for being a moribund franchise, their numbers so far this season are not so dissimilar from the Steelers'. Whether that is cause for hope for Lions fans or reason for a general panic in Pittsburgh remains to be seen. One thing that jumps out is that if Stefan Logan does not have a big day on Sunday he may never have one.